Hot Backups – MS VSS Integration – Back up live VMs with zero downtime by leveraging the Microsoft VSS Hyper-V Writer. Restore Clones – Restore VMs to the same Hyper-V Host but with a different name. Restore to different Hyper-V host – Restore an individual or a group of VMs to a different Hyper-V Host. ReverseDelta Incremental Backup – Incremental Backup Technology for hyper-speed efficiency. File Level Restore – Mount backed up VHDs and restore files without having to restore a whole Virtual Machine. Backs up Hyper-V clusters – Cluster support for larger installations. Backup schedules – Set different backup schedules for different VMs. Supports Microsoft Hyper-V Server (Core) – Works with the free Microsoft S Hyper-V Server (Core). Sandbox Restore Tests – Build a plan to make sure that in case of disaster you’re fully covered. Backs up Hyper-V Snapshots – If your VMs have snapshots than you can back up the snapshots as well. Offsite Backup with WAN Acceleration – Backup to an offsite Altaro Backup Server over a WAN connection for added redundancy. 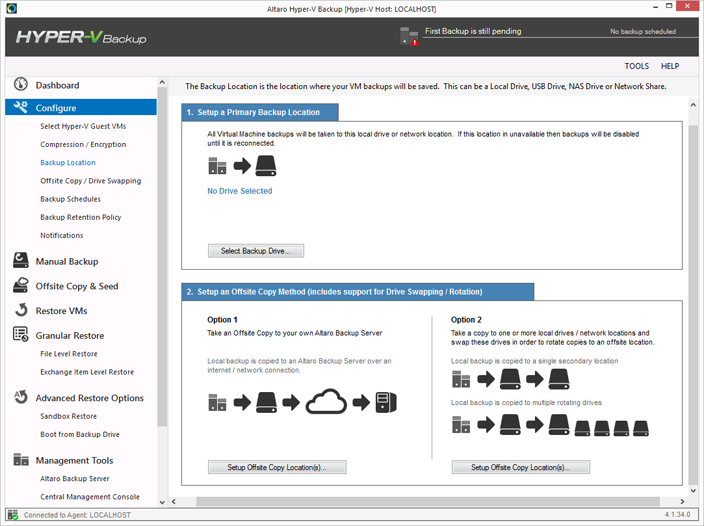 Remote Management – Manage your Altaro Hyper-V Backup from another machine. Backup Compression – Get smaller and faster backups by enabling compression on your backup drive. Backup Encryption – Secure your backup data with military grade AES encryption. Microsoft Exchange backup and Item Level Restore -Backup your Microsoft Exchange server and restore at Item level from within the Exchange database.